Once you have investigated some stool samples, you will have some knowledge about the predator-prey relationships in a certain biome. In order to keep track of this information and visualize the ecosystem, you can create a food web! 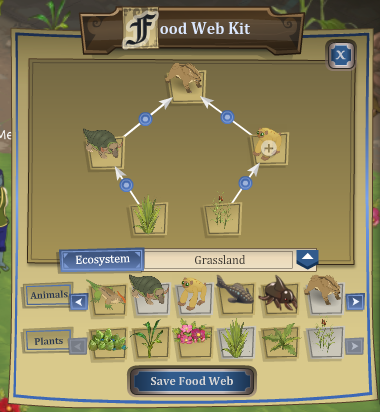 Using the food web kid players can add species and draw arrows specifying who eats whom in their food web. The food web kit itself does not know whether a food web drawn in it is accurate, but it does know if stool data has been collected about each relationship. 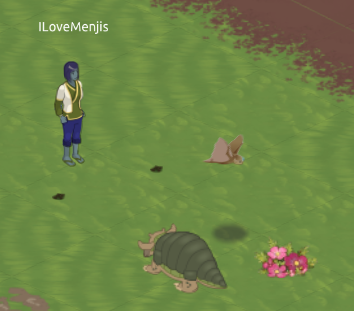 Certain quests in the ecology quest line ask players to create and turn in a food web to explain what they have discovered about the ecosystem. Draw food webs and send them to your friends to compare notes. Start by picking up some poo and then turn it into a beautiful web of life! 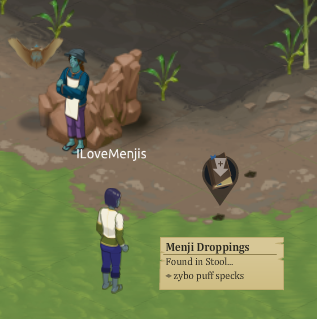 When you activate your stool tool, you will suddenly be able to spot the droppings of various creatures in the world. By using the stool tool to examine the feces, you can often identify recognizable bits within them. This provides you with valuable information about what that creature has been eating. Of course, some animals digest their food so well that there is nothing recognizable left in it. Some may wonder why we designed such a tool into the Radix game, and while we could say it was to satisfy our affinity for toilet humor, stool samples are an authentic and valuable tool that ecologists use and they contribute to the embodied experience of The Radix Endeavor. If you're ready to get your hands dirty, look for the Population Arbitration quest line in Murky Maws. Or, just walk around the world with your pooper scooper and see what you can find! The island of Ysola has a long history, much of which has not been recorded and lives on only in the memories of the ancients. Some of the more recent history is known, but is in danger of being erased by those in power. The Radix Endeavor game starts off at a time when big change is imminent on the island and much work is being done to shape that change. Watch this prequel video to reveal one more piece of the puzzle and understand how the Curiosi were formed and what they are fighting for - or rather, what you are fighting for, if you choose to work alongside them. Many questions surround the infamous Ysolian skull houses. How old are they and how have they been preserved? 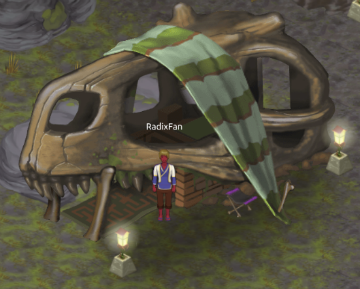 Whose skull is that anyway? Do the inhabitants have to brush those teeth regularly? Theories abound but answers are few. If your travels around the island have not yet revealed its location, then you have much left to explore!